I am enclosing two pictures of the cane I mentioned ... The story, as I got it from another party, checks out a little. First, he bought it at the Cancer Society thrift store. I checked this out, and it was true. But there was no way the Discovery Store could go back through its records to find out which lot it came in. The next part is a little fuzzy. but consistent with the stories that the seller often tells. He had a lady who lives near him do some on-line research. He had it in a folder which he was going to give to me, but someone broke into his car and stole everything. The lady who did the research, subsequently became [annoyed] at him and won't retrieve the information from her computer. But, as he recalls the research, J.C. Turley, the man who presented the cane, was an engineer on the Central Pacific Railroad, and he was the engineer when the railroads meet in Promontory. Of course, he could have worked for the Union Pacific, been an engineer on either railroad, on any leg of the route. Or had nothing to do with the railroad! There was a J.C. Turley living in Elk Grove in 1873. He was an officer in the A.O.U.W. either the Ancient Order of United Workers or the American Order of United Workers. The 1880 Sacramento County directory has a John Turley, b. 1833, Ireland, blacksmith, married. 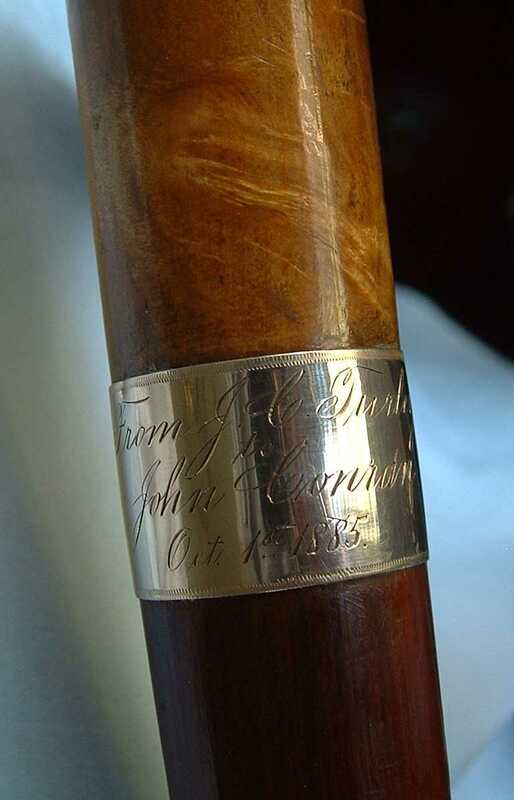 The cane has a California laurel handle, a redwood base, and a gold ring in between, inscribed J.C. Turley to John Conran, October 1, 1885. I'll appreciate anything you can provide. The cane was a very special gift and there probably was a significant reason for the presentation.